Whether a consumer knows it or not, using a search engine to browse content on the Internet automatically engages him with the world of Search Engine Marketing (SEM). Advertisements on a Search Engine Results Page (SERP) often feature content specific to recent search history and Internet search trends. There is a reason this phenomenon occurs: companies pay for this context-specific advertising. Marketers may wonder, "How do advertisers gain access to specific advertising space?" or, "How could a real estate agent use this form of advertising to promote real estate services throughout a local market?" Search Engine Advertising: Buying Your Way to the Top to Increase Sales by Kevin Lee and Catherine Seda outlines SEM fundamentals to help marketers optimize their online presence through search engine advertising. As the majority of information searches today are performed online, an effective SEM campaign is an essential component of an online marketing strategy. Incorporating SEM into real estate marketing practices has to potential to add significant value and create differentiation for agents who are willing to engage. THINK POINT #1 - Why Pay for SEM? Search Engine Optimization (SEO) works for the real estate engine by driving Web content higher up on the SERPs of major search engines such as Google or Yahoo. Unlike SEO, SEM is driven by keywords and pushes content onto search pages through paid advertisements. Since SEO marketers cannot always control the outcomes of their search engine positioning tactics, SEM and SEO can (and should) work together. Although paid, search engine advertising has proven to be the more effective way to reach specific target markets. Lee and Seda's book compares the outcomes of SEM to a "perfect" direct mail campaign: if a direct mail advertisement could reach its intended customer at the exact time the customer thinks about the specific product or service, the direct mail ad would achieve similar results to that of effective SEM. 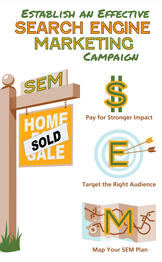 SEM empowers its users to choose the specific market(s) to which they want to advertise. While consumers ultimately must choose whether or not to click on an advertisement, the chances of connecting with an intended audience are greatly increased. Most SEM platforms (such as Google or Bing) also provide the added benefit of analytics, allowing the marketer to track ad-clicks, which can help determine the specific return on investment (ROI) of a SEM campaign. Once an agent has decided to invest in a SEM campaign, it is important to understand the available search engine advertising options. The two main SEM strategies marketers can choose from are 1) run-of-network advertising and 2) behavioral-targeted advertising. Run-of-network advertising is an option that allows users to target advertisements to a generic advertising network (such as real estate or automotive) at the expense of the ability to dictate the specific sites where ads are placed. This option allows users to reach a large, broad audience in a general category with a relatively limited investment. Behavioral-targeted advertising uses data stored on users' search engine and web browsing history to target ads based on data collected while searching/browsing. For example, if a consumer searches for "cars" online, behaviorally targeted automobile insurance advertisements may appear in his subsequent searches, as purchasing insurance is a behavior commonly associated with the automotive category. The investment for this behavior-specific method is significantly higher, but allows marketers to target a specific audience more precisely with their advertisements. Distinguishing between these two methods of SEM (both driven by keywords, but focused in different ways) and considering the relative cost/benefits is necessary before moving forward with a SEM campaign. In 2010, the Network Advising Initiative (NAI) conducted research on the effectiveness of behavioral-targeted ads versus regular, run-of-network advertising. The study revealed that while the price tag is higher for behavior-targeted ads (the weighted average cost per thousand ad impressions (CPM) for behaviorally-targeted ads was $4.12, as opposed to $1.98 for run-of-network advertising), they are more than twice as effective as run-of-network advertising at converting users who click the advertisements into buyers (Network Advertising Initiative 2010). Additionally, behavioral-targeted ads converted 6.8% of clicks into buyers, versus a 2.8% conversion rate for run-of-network users. These figures translate into a cost effectiveness of $.61 per 1% conversion versus $.71 per 1% conversion, respectively. The additional investment for behavior-targeted ads may be seen as a downside; however, spending more initially can translate into a more cost effective method of SEM advertising in the long-run. Cost Effectiveness: $.61 per 1% conv. Cost Effectiveness: $.71 per 1% conv. When considering the use of behavioral-targeted advertisements for a real estate business, consider the types of searches or web behaviors that could drive interest in real estate. Users searching for information about investment options, school systems, property taxes, and other market-specific searches might be a good place to start when considering behavior-targeted ads for real estate agents. Behavioral-targeted ads and their anticipated expansion were discussed briefly in Lee and Seda's (2009) text. While the basic principles still apply, it is important to note that the use of behavioral-targeted ads have expanded greatly in the two years following the book's release and the information above reflects the latest information available. Pre-planning for a SEM campaign is arguably the most important step in the SEM process. Two main points should be considered when beginning the planning process. As is true with all advertising, each market is different and requires different approach mechanisms. Simply put, it pays to know the market before you pay to reach the market. Research the intended audience and uncover what they find important before structuring a plan to sell to them. In the case of SEM, marketers pay to reach a context-specific audience, so it is important to plan with great intentionality. With SEM, marketers are purposely targeting consumers searching for their services, not someone casually browsing through ads. Therefore, the message of the advertisement should be product-specific, accomplishment-specific, or action-oriented, and all geared toward the specific targeted audience. Consider advertising specific properties available for sale or for rent, highlight personal career or market-specific accomplishments, or encourage end-users to check out your latest ___ by clicking your advertisement. Understanding the intended market and message is the place to begin the SEM planning process. Where will a prospective buyer or client land after she decides to click on an advertisement? With this question in mind, consider that it is important to give as much attention to the landing page as is given to the creation of the ad: the consumer's attention is captured - now work to keep it! Once a prospective buyer or client clicks an ad, inspire her to stay on the site by delivering on promises consistent with the ad, providing quality content, encouraging her to take action, and by creating a clear, easy end-user experience. After choosing to incorporate SEM into a marketing strategy, considering the available SEM options, and engaging in pre-campaign planning, the SEM campaign is ready to launch. Each SEM campaign is built on four decision areas: 1) search engine platform 2) keywords (words or phrases used to narrow searches) 3) categories (the general sectors or industries linked to the advertisements), and 4) budget available. Choosing search engines is based largely on personal preference and pricing models. More in-depth information about each platform (including demographic and category-specific data) is easily accessible on each company's websites. Some of the more popular SEM platforms to consider include Ask's Ad Program, Bing/Yahoo! Advertising and Google Ads. Additionally, choosing the mix of keywords and categories that fit the firm's specific objectives is very important. The words/categories chosen will dictate the advertising audience. Being mindful of the budget for a SEM campaign can also dictate the breadth of the available advertising audience. Whatever the "perfect" mix is, an effective SEM campaign will be carefully planned to reach the target market and should increase both visibility/recognition and sales from search engines. In Wichita Falls, TX, real estate agent Ashton Gustafson (AG Real Estate & Associates) recently set up a search engine marketing campaign to promote his business' expansion to Waco, TX. Ashton considered a number of search engine advertisers' services and chose to advertise primarily on Google (he also advertises on Yahoo and Ask, but chose Google as the primary as it holds over 75% of the market share). When considering keywords, Ashton picked words representative of the town and state he was advertising in ("Waco" and "Texas"), but also chose words specific to his listed properties. For example, Ashton used the keywords to target specific areas of a town (e.g. "homes near Waco High School") to capture both consumers looking for homes in that area and browsers looking at the high school or school system. Ashton determined a general budget prior to signing up for Google's services, and was then able invest specifically based upon the prices Google set for each particular keyword. His ads included a variety of more affordable, specific keywords and some expensive, general keywords. Ashton also emphasized the use of Google's advertising analytics (included with ad purchase) to track clicks on his advertisements and his conversion rate to sales and rentals - which ultimately helped him determine the ROI from his ads. Take advantage of the potential to engage prospective clients through SEM. Being proactive in the space of online advertising will differentiate an agent from his competition and can increase his customer-base if he is willing to invest the time and resources into an effective campaign. Lee, Kevin and Catherine Seda (2009), Search Engine Advertising: Buying Your Way to the Top to Increase Sales, New Riders: Pearson Education. Network Advertising Initiative (2010). Study Finds Behaviorally-Targeted Ads More Than Twice as Valuable, Twice as Effective as Non-Targeted Online Ads [Press release]. Retrieved from https://www.networkadvertising.org/pdfs/NAI_Beales_Release.pdf. Mark is a first-year graduate student from Pawtucket, Rhode Island. He earned his BA in Public Relations and Marketing from Pepperdine University, Malibu, California.